HALABA SPECIAL WOREDA & MAREKO WOREDA, SNNPR, 22 March 2016 – In the northern part of the Southern Nations, Nationalities and People’s Region (SNNPR) of Ethiopia, bright yellow jerry cans are everywhere: on main roads and dirt roads, carried by hand or piled high on donkey carts being led on long journeys. Whatever the method, the goal is the same: water. In SNNPR, 73 out of the total 136 rural woredas (districts) are grappling with water scarcity. Out of those, 45 are severely affected. In many of these woredas, water scarcity is an old problem, made much, much worse by the ongoing drought, which is the worst this country has experienced in decades. 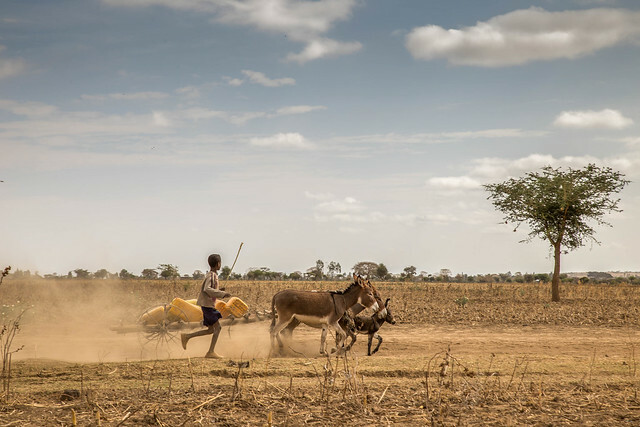 The result of a double blow of climate change and the El Niño phenomenon, the drought has led to food shortages and threats to livelihoods and survival. Lack of water affects everything: food, health, education and children’s futures. 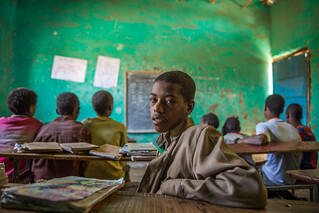 In Washe Faka Primary School, located in Washe Faka Kebele (sub-district), Mareko Woreda of SNNPR, approximately 20 students have left school in search of work to support families whose livelihoods have been turned upside down by the drought. The children who remain in school are struggling. “Students are coming to school with empty stomachs and leaving early because they can’t focus,” says Selfa Doloko, the school principal. Fifth-grader Wogbela, 15, is struggling too. Every day after school, he travels hours to a water point in a neighbouring area. Because of the distance from his home, he has to stay overnight at a relative’s house. There are closer water points, but the long lines often mean hours of waiting. “I used to go every other day, but the drought has dried up the ponds here, so I have to get water for the livestock in addition to water for the family,” he says. In the morning, Wogbela travels home with his supply of water. He is tired by the time he gets home, but has to rush to school. “I am late to school every day,” he says, worried. Education is important to him, but it takes a backseat when there is no water. This is the story of so many children here, but thankfully for some, there is finally relief in sight. For the students of Asore Primary School in Halaba Woreda, a new UNICEF-supported water point approximately 30 metres away means a new shot at learning. Students like Munira, 13, an eighth-grader at the school, can finally breathe a sigh of relief. “I used to travel two to three hours a day to fetch water. The wait at the water point was even longer. Sometimes the taps did not work and I would have to spend the whole day there and go home the next day. It was so tiring and a waste of time,” she says, glad that clean water is now just a short walk away. As part of the drought emergency response, UNICEF, as the WASH cluster lead, is supporting the Government of Ethiopia and other partners in the rehabilitation, maintenance and construction of new water supply systems, provision of water purification and treatment chemicals, scaling up of water trucking activities, and provision of sanitation and hygiene facilities in schools. UNICEF is also exploring innovative ways to use satellites to detect deep groundwater for large scale, multiple-village water supply systems. With 5.8 million people around the country in need of access to safe drinking water, UNICEF and partners are racing against the clock to provide urgent help.